The aim of this page is to contain all the basic timing information you'd need to get a microcontroller to to output a greyscale display for a TV via a composite video signal. I live in the UK, hence my bias is towards PAL signals. NTSC is not too different (when talking greyscale), and where possible, I'll include relevant details. A later article/info page will probably cover methods to actually get a microcontroller to output this signal. Uses Yellow Phono (aka RCA) connectors. "Greyscale PAL signal" is an oxymoron (PAL or 'Phase Alternating Line' describes the encoding of colour data). "ITU System I" is more accurate. I still call it a 'black and white PAL signal'. I've missed off loads of details (broadcast engineers : run away - you'll be horrified). It's an old system at heart; many of it's features are to help old valve-era technology reliably display a reasonable picture. Modern TVs have to do lots of 'munging' to display the signal on a pixel-based screen. My largest problem: Both of my 'fairly modern' TVs are too good. They'll take any signal that's vaguely correct and display it beautifully (Hence I can't easily work out if I've got it absolutely correct!). Signal split into contiguous 'frames'. A frame describes a whole, single, image to display on the screen. Each frame is further split into (contiguous) scanlines. Each scanline is 64μs long. 25 frames per second (NTSC: 30 [greyscale]). Each frame is 2 (contiguous) fields. "Field 1": image data for even lines (yes - this is correct). "Field 2": image data for odd lines. Image data within scanlines, left to right, top to bottom. 312.5 scanlines per field (NTSC:262.5). PAL: Field 1 is an even field, Field 2 is odd. 575 'active video data' scanlines per frame. 287.5 'active video data' in 'even' field. 287.5 'active video data' in 'odd' field. On digital equipment, this is often rounded up to 576 scanlines, 288 per field. Hence modern descriptor: 576i/50 : 576 display lines, interlaced, 50 fields per second. Enables TVs to 'lock on' to signals. Sync signal level is '0v'. Always a small 'quiet' 0.3v 'blank' period around sync pulses (stops old circuitry getting confused). Originally designed as times where the electron gun in the TV was 'blanked' for the retrace back to the left/top-left of the screen. Sits between lines of image data. Contains "start of line" point. Accurate timing is crucial in getting jiggle-free images. Sits between fields of image data. Contains a special sequence of sync pulses. Contains the 'start of field' point. These periods overlap. (Sync pulses areas in field blanking period take precedence). The following (probably over-simplified) diagram shows how these blanking periods overlap. In the real signal, the field blanking period covers more scanlines and there are far more scanlines in a frame! Contains the 'start of scanline' sync pulse. The following diagram shows a signal's voltage level over a couple of horizontal blanking periods. Note: Note: Some scanlines with horizontal blanking periods fall within the Field Blanking Period. These scanlines do not carry Picture Data (they can, however, carry other data, such as teletext). Start of H-Sync signifies start of scanline. Many more details (rise/fall times etc.) left out here. Back-Porch is where colour synchronisation occurs. Back-Porch is empty for monochrome. A scanline 'starts' when the H-Sync pulse starts (yes - worth repeating). Timing of H-Sync pulse start is crucial. Jitter on H-Sync pulse = wobbly picture (effect similar to poor video recorders from the 80's). Length of H-Sync pulse less critical. Most microcontroller video output seems to use 4μs H-Sync pulse. Hides movement of electron gun trace back to top-left of screen. Contains 'field start' datum point. Odd Field Blanking: starts at normal scanline boundary. Even Field Blanking: starts halfway through scanline. Each section lasts for 5 half-scanlines. (NTSC: 6 half-scanlines). A field's 'start point' is the start of the first broad sync. The 'Short Sync' pulse is exactly half the duration of the H-Sync pulse. The following diagram shows the first 15 half-scanlines in the field blanking period. The diagram does not show the whole Field Blanking Period. The blanking period extends for a further 18.5 (whole) scanlines. Most TVs are happy with one single long sync-pulse in place of the 5 broad pulses. Easier than full interlacing (if you don't need that level of picture detail). Which areas are actually 'displayed' on the TV? Even Fields: half-way across line 23 down to the end of line 310 are displayed. Odd Fields: line 336 to half way across line 623 are displayed. The 'Active Display Area' of a scanline is 51.95μs. Therefore 287.5 lines (288 in the digital world) per field. Note: The short-sync pulse half-way through line 623 should still be output. 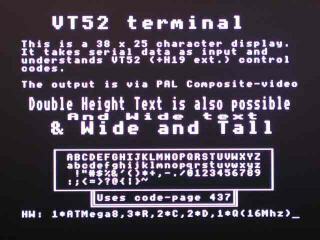 Note: The 'never displayed' scanlines (scanlines 7-22 and 320-335) can be used to signal data, such as teletext. Two fields of 288 lines, with 51.9μs per line in the 'active portion'. Is all of the 'active display area' actually visible? No. Depends on your TV & it's settings. 'Overscan' is the part that's not shown. There are generally accepted 'safe areas'. 29 text-unsafe lines at the top. 29 text-unsafe lines at the bottom. 41.6μs centre of the "active display" in scanline is 'text-safe'. Q. Should there be a blanking period before prior to the short-sync on line 623? A. Yes. I think that it actually starts Front Porch_μs earlier than the colouring on the above diagram shows. Q. Should the 'display from half way across line 23' be half way across the scanline or halfway across the picture data? A. It should actually display from (32μs + HSync_μs + BackPorch_μs) - e.g. the diagram above stops the coloured area too soon. Q. As it stands the diagram seems to show that 58% of the top display line on the even field is visible, and only 42% on the bottom display line of the odd field. Is this right? A. It's actually worse than this. I believe that the top display line (23) should only show 38% of the "picture data" and the bottom display line (623) should only show 38% as well. Fake 'progressive signal' (as described at the end of the "Field Blanking" section).